With no BIRTHdays to celebrate quite yet, I am refocusing all my Thriving energy on enjoying the Fall! 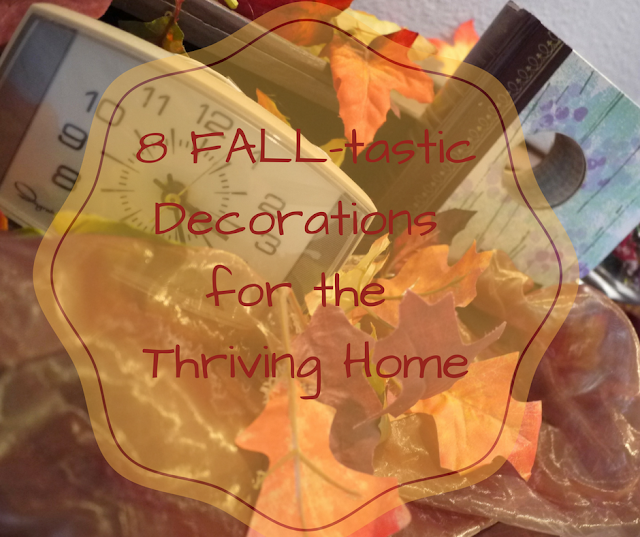 Now that we are nearing the end of September, if you have't decorated yet, it is high time you get started! Here are my eight favorite and super affordable ways to sing Fall-a-lejua all throughout the house! 1. Assorted Colored Stones of Sorts. Whether marbles or jewels, big or small, anything in Fall colors will do. I have had these assorted autumn cuties for years and love that I can reuse them each season. On a platter, in a jar, sprinkled on a mantle...the list goes on! 2. Fabric. Also something I acquired long ago, but have been so grateful to have stored away! In brown, bronze and orange, shiny and matte these signature pieces are perfect for "shwagging" any and all surfaces. With so many choices and coupons to use at the fabric store, make the tiny investment this season and you won't be disappointed when you use them again and again! 3. Sparkly Pumpkins. When I found these minis at the Dollar Tree I snapped them up with the quickness. Something about pumpkins and glitter just really gets me going. Especially knowing it is not going to get all over my clean house! My big guy was a 50% steal at Michael's with an additional 40% off!! I mean it was practically free which makes me love it all that much more. 4. Go-To Collection of Mini Pumpkins & Gourds. I again, have had these same supplies for years and always look forward to their annual debut. Did I also mention how incredibly easy and gorgeously green all this reusing is? With a simple sprinkle here and thought- out placement there, every surface in your house transforms making it oh so Fall-tastic! 5. Throw Pillows. These are the pillows I use year round. They are well made and have lasted a very long time. I add a vintage pillow cases in the "off season", but when Fall/Winter set in they are naked and in full force! I love their shiny burgundy color and that one side is silky smooth while the other has gold accents...they are perfect in their true form from September to December! 6. Leaves. While I personally am not a fake plant/silk flower girl, I have NO problem busting out some silk leaves in the Fall. Once you buy your first bag (or bunch depending on where you go) you will NEVER need leaves again! Also, there is no "real" leaf collecting, no "real" leaf mess and when your kids help you decorate (as mine did) there are no "real" leaves to crunch! 7. Thriving Art. This addition to my "Fall collection" is by far my favorite...and the most cost effective. Since the boys and I do art sessions pretty regularly it is easy to throw in some seasonal projects. This year, using my favorite non-toxic, water based finger paint (which was a phenom investment at Target for $10) we used fall colors to do some hand prints and smears. Once they hung to dry I simply cut them out in the shape of an autumn leaf and boom! Perfect art to add to the gallery! 8. Fall Candle. My Thriving Mommy and I have yet to get around to making an Autumn collection of our DIY candles, so I head to Target for their soy candles in my favorite scents. I can honestly tell you I burn these nonstop and am obsessed with how they make my entire home smell amazing! These are a must have when you do your Fall-fromation for sure! With my house in FALL swing inside and Halloween showcased outside there is only one thing left to do, enjoy it all and wait for my fourth little man to join in all the autumn fun! What are your favorite Fall accents to add to your home?